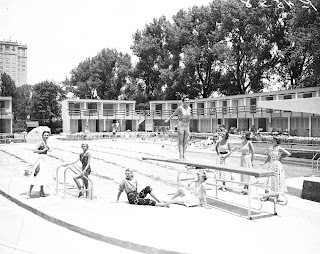 This is probably one of the best images I've encountered of the pool at the old Edgewater Beach Hotel. It was taken around the time of the 1951–54 extension of Lake Shore Drive from Foster Avenue to Hollywood, which effectively cut off the hotel from the beach, leading to a sharp reduction in business. Hard to advertise yourself as a beachfront hotel if you're no longer on the beach. The Edgewater finally closed in 1967 and the main buildings were torn down shortly after.